Annual Michigan punk festival Bled Fest is saying goodbye after one final edition happening May 25 at the Hartland Performing Arts Center. The fest is also currently announcing one artist per day for the month of February for Free Ticket February. The way it works is Bled Fest gives a lineup clue on Twitter, Facebook, and Instagram, and if you’re the first to guess right, you win a free ticket to the festival. More info here. You can also purchase tickets. The lineup is already looking pretty great, and so far includes The Wonder Years, Camp Cope, For The Fallen Dreams, Kississippi, Iron Chic, awakebutstillinbed, Worriers, Prince Daddy & the Hyena, SeeYouSpaceCowboy, Koji, Monte (who are reuniting for just this one show), and The Sonder Bombs. Stay tuned for more artists TBA. For Australia’s Camp Cope (who released our #1 album of 2018), Bled Fest happens right at the end of their US tour, which includes a BrooklynVegan-presented Brooklyn show on April 25 at Warsaw (tickets). They don’t want us anymore. This will be the final BLED FEST. We’ve always said that the festival will cease to exist when we can’t do it in the old school building anymore, and we’re holding to that. The powers-that-be have finally decided that this building is “not intended for” this type of event, but are allowing us, with a few small changes, to host one last party. So let’s go big. This was never supposed to happen anyway. The whole thing doesn’t make sense. The name. Big Love’s Educational Festival. That’s fine, in and of itself, because it defines what it was in the beginning. Ben (Big Love) hosting a bunch of his favorite bands, of many genres, at a pool party / basement show at his parents house, to celebrate the end of the 2005 school year. Then, the 2nd year, when 200 people showed up to Ben’s house, his parents said “no more”. Then it moved to a skating rink and turned into strictly a metal show for one year with new partners, with a lineup that was sweet, but strayed away from the entire intent of what BLED FEST was supposed to be, showcasing multiple types of music. But it WAS called BLED FEST. You know, like blood. Metal. Try explaining this to a township board or a school employee. Or your parents. After that 3rd year, Ben considered shutting the whole thing down. Before doing that, Ben brought me (Nate) the idea, asking where we could host it, and we were at a show at the Hartland Performing Arts Center, and we kind of walked around the building and said “We could put a stage over there. And over there. And maybe one there?” and BLED FEST, in its current iteration, was born. In my old high school. Every Time I Die and Andrew WK and Anti Flag and La Dispute and Title Fight and The Wonder Years and so many more have played chaotic sets on that 2 foot tall plywood covered stage, in the old cafeteria where I used to eat lunch every day. And remarkably, the school district just handed me the keys to the building and said “don’t break anything”. And we haven’t (at least on purpose). And it has to be said, they didn’t have to let us do this. They probably shouldn’t have, but we proved their trust in us to be justified, for the past 11 years. I’m not even upset that they’re closing the door on this chapter, because they, by all rights, probably never should have opened it. It doesn’t make sense. It’s not where a festival is supposed to be, but that’s part of what makes it so special. No barricades. No line between artist and fan. One mass of sweaty humanity, joining together, leaving the world outside, raging together in a world of like-mindedness, respect, and diversity. In a place where everyone’s not only welcome, but encouraged to be themselves. A place not funded by beer sales or corporate sponsors. The festival dies when the building is no longer available. We’ve said that all along. And we’re going to stick to that. After the 2019 version of BLED FEST, the 15th overall, and 12th at the H-PAC, we’re going to shift gears. BLED FEST will end, and we’ll take our collective energies and we’ll start something else together that doesn’t make sense, that isn’t supposed to happen, that is hard to explain to your parents, and even harder to explain to the music business. You’ll either get it, or you won’t. And we’ll gather in a new alternative space, somewhere, and we’ll scream lyrics together and jump off of stages and scream the words with our favorite bands, and it’ll be magic. But right now, we’ve got work to do, one more BLED FEST to put together. So let’s do that. We’ll see you Memorial Day weekend, same as we have for the past 15 years. One more time, for Big Love. 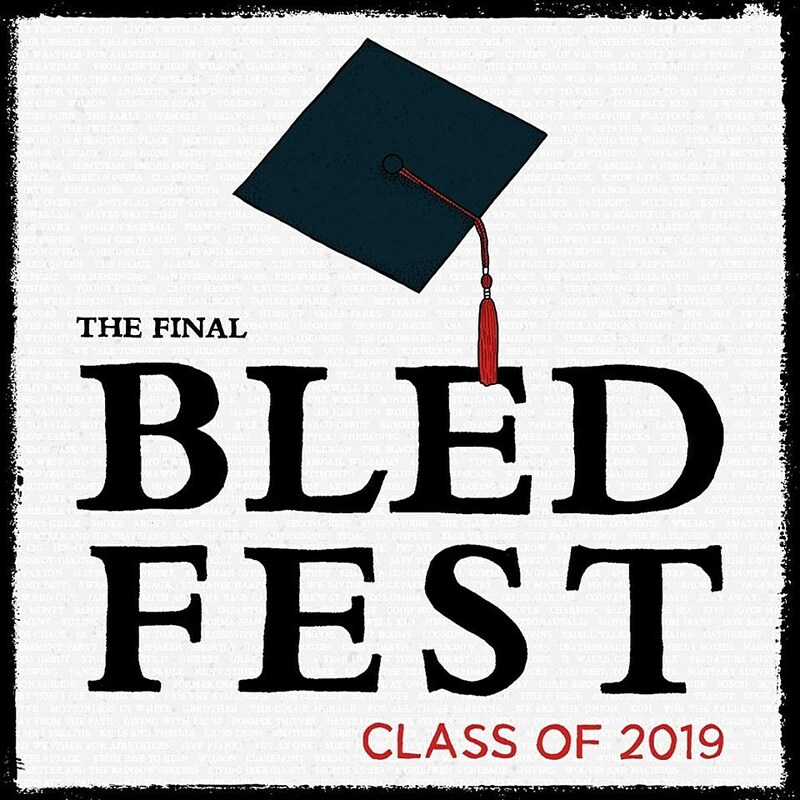 In 2019, BLED FEST graduates.